Frank Barnes, Markus Kolb and Stock Plum were builders and music fans who wanted a robotic rock band and built the members of Compressorhead. Fingers the guitarist has a system of 78 pneumatic tubes permanently attached to his guitar, acting as fingers for manipulation. Bones the bassist has one hand with fingers to pull strings and another to manipulate the fingerboard. Stickboy the drummer has four arms and two legs to hit drums and cymbals while stomping kick pedals. The band and its human makers are running a Kickstarter campaign to fund a fourth robot to do vocals. Construction of the robot, programming, building a recording studio, and developing an app are all activities that the crowdfunding money will finance. Mindlink is the app that the band is building to keep fans connected with the band. Every time the band becomes active the app will send alerts and display a combination of programming lines and text. Further developments might include a badge that lights and flashes when the band is playing. Construction of the robotic lead singer has been underway for a few months. The video at the bottom of the article shows some of the construction of the drive train. The team assembles the components and eventually tests the chassis. 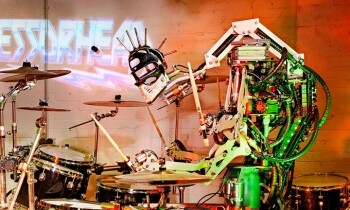 These robots are incredible as constructs themselves but also as musical instruments. 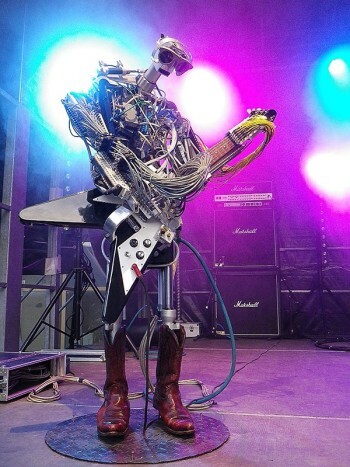 Unlike the Rock-afire Explosion or Disney robots Compressorhead is a group of tools, being programmed to complete the task of making music instead of as moving statues. The robot musicians are not bolted to the floor and I'm assuming if they make that telltale compressor / clacking sound it will be muffled by the loud music.